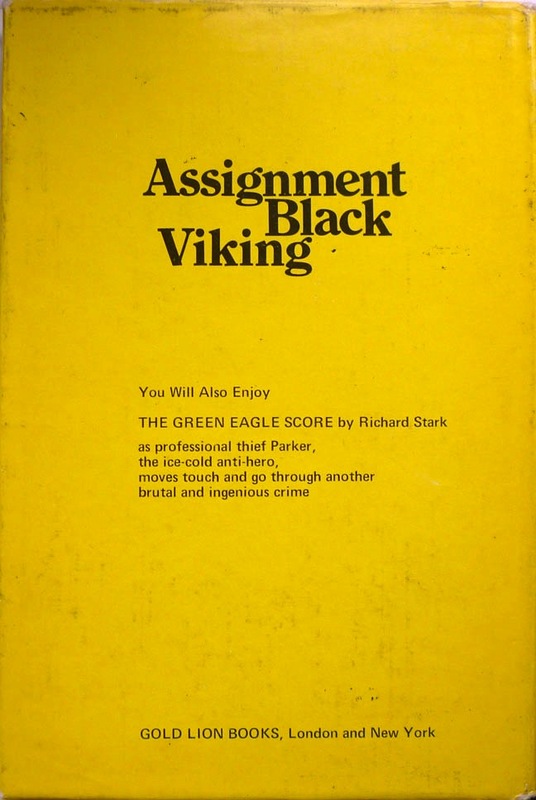 Published in hardback in the UK by Gold Lion in March, 1973 – originally published in the US in paperback by Fawcett/Gold Medal in 1967 – Assignment Black Viking was part of British publisher Gold Lion's first wave of thrillers, alongside Richard Stark's The Green Eagle Score and Dan J. Marlowe's Operation Drumfire, both of which also arrived that March. 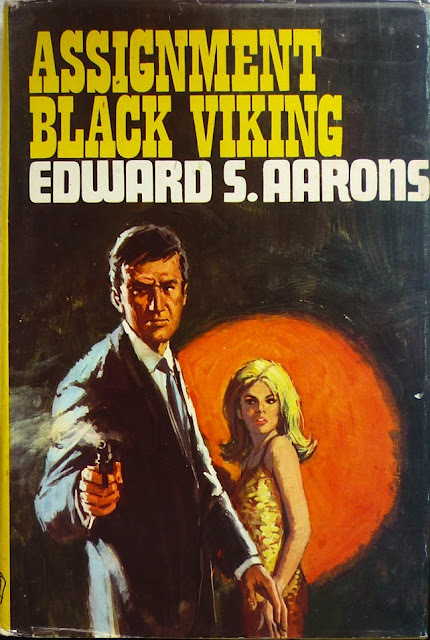 As ever with Gold Lion books, the cover painting is uncredited, but I suspect it's the same nameless artist who illustrated the dust jackets of pretty much all of Gold Lion's republished-from-American-originals thrillers in the first half of 1973. 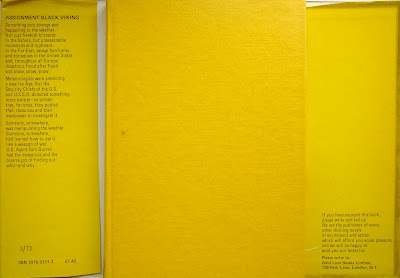 If anyone has any idea who the artist is/was, get in touch; I'd love to learn his (or her) identity – and to find out some more about Gold Lion, for that matter: who they were; how long they were in business; who was responsible for hoovering up all those US Gold Medal titles they published into hardback (did they have some kind of rolling deal with Gold Medal, a la Frederick Muller in the 1950s and '60s?) – anything, really. 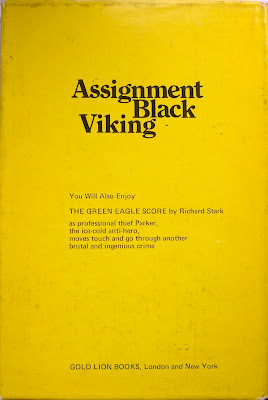 Gold Lion would go on to publish a further two Aarons novels in 1973, seemingly selected just as randomly from the author's backlist as Assignment Black Viking was: a standalone suspense work, The State Department Murders, which was originally published in the States by Gold Medal in 1950; and Assignment Helene, originally published by Gold Medal in the US in 1959, and dating from much earlier in the same series as Assignment Black Viking. 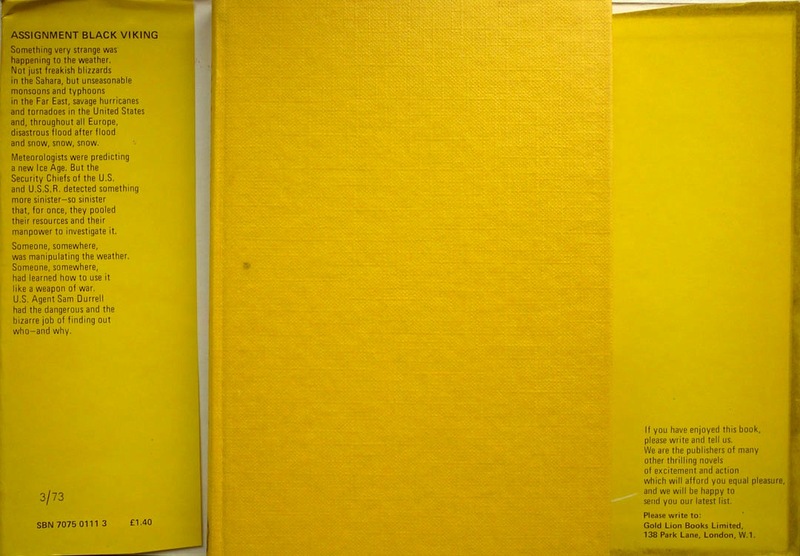 An additional Durell Assignment, Assignment Budapest was published in hardback in 1974 by White Lion – who may, or may not, have been part of the same setup as Gold Lion.